Ever since the former Tánaiste left office, there have been rumours of her return. 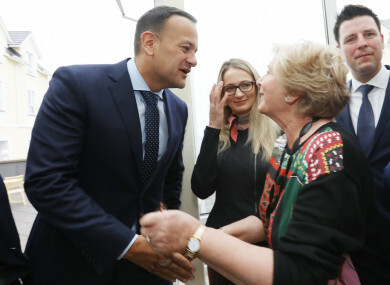 Taoiseach Leo Varadkar with the former Tánaiste Frances Fitzgerald at this year's party think-in. AGAINST THE BACKDROP of Galway Bay, the Fine Gael troops huddled together for their annual ‘family photo’ at the party think-in. Up front and centre, there was a familiar face. Former Tánaiste and Justice Minister Frances Fitzgerald. Last November, Fitzgerald resigned following days of controversy around the legal strategy used against Garda whistleblower Maurice McCabe during the O’Higgins Commission. In a statement, Fitzgerald said that she would be stepping down with an immediate effect, stating that she believed the decision was necessary “to avoid an unwelcome and potentially destabilising general election at this historically critical time”. No sooner had she stepped aside, she was out announcing that she plans to allow her name to go forward for the Dublin Mid West constituency in the next general election. Having been selected at the convention, she will be running alongside South Dublin County Councillor Emer Higgins. Despite her public fall from grace after a long career in politics, there was nothing about the Fine Gael photo shoot that suggested that she was being quietly retired. In fact, she is just a few feet away from Taoiseach Leo Varadkar. Ever since she left office, there have been rumours of her return. The Taoiseach has been asked about it in the past, and has never ruled it out. It’s worth mentioning that the backing of Varadkar during the Fine Gael leadership was key, and was seen as a major win to bag the veteran Fine Gaeler. It is understood that there has been pressure on Varadkar to return her to ministerial office, with some insisting that there should be a 50/50 gender split in Cabinet at the next reshuffle. The mood at the Fine Gael think-in this week is that Fitzgerald was “hounded out of office”. “She’ll be back,” said one TD, while another said she was only ever going to leave her ministerial role temporarily. This is not all that surprising. Varadkar stood by Fitzgerald throughout the McCabe controversy and email-gate, and constantly stated that she did nothing wrong. Whether she did or not – that is for the Disclosures tribunal to determine. Judge Peter Charleton is due to deliver his tribunal report shortly. Speaking to the media at the Fine Gael think-in, Fitzgerald said she would wait until report is delivered before making any comment on how events transpired and her exit was handled. “I look forward to hearing what the tribunal has to say,” she said, adding that she would refrain from making any further comment. The last question Varadkar was asked at this year’s think-in in Galway was whether he would bring Fitzgerald back if there is a Cabinet reshuffle. “I’m not going there,” he said with a grin. Email “Will Frances Fitzgerald be made a minister again? She was up front and centre at this year's think-in”. Feedback on “Will Frances Fitzgerald be made a minister again? She was up front and centre at this year's think-in”.